I'm so excited to have some of the new Impression Obsession inks to play with! I wanted to bring you a review of what these inks can do - they are a lot of fun, and a really great all-purpose ink! These 48 raised felt pads are a hybrid ink... and hybrid ink is a huge victory for those of us who like to use a variety of different mediums but don't want to have a different ink for each one. 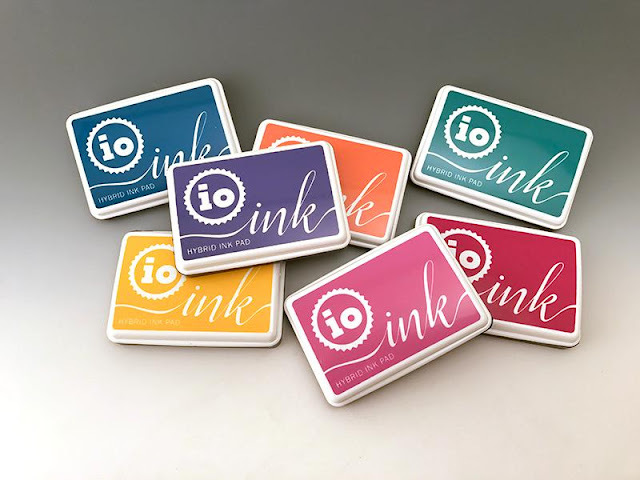 The IO site describes the hybrid ink this way: "Featuring the best of both worlds, it dries quickly like a dye pad but has the coverage and opacity of a pigment pad." 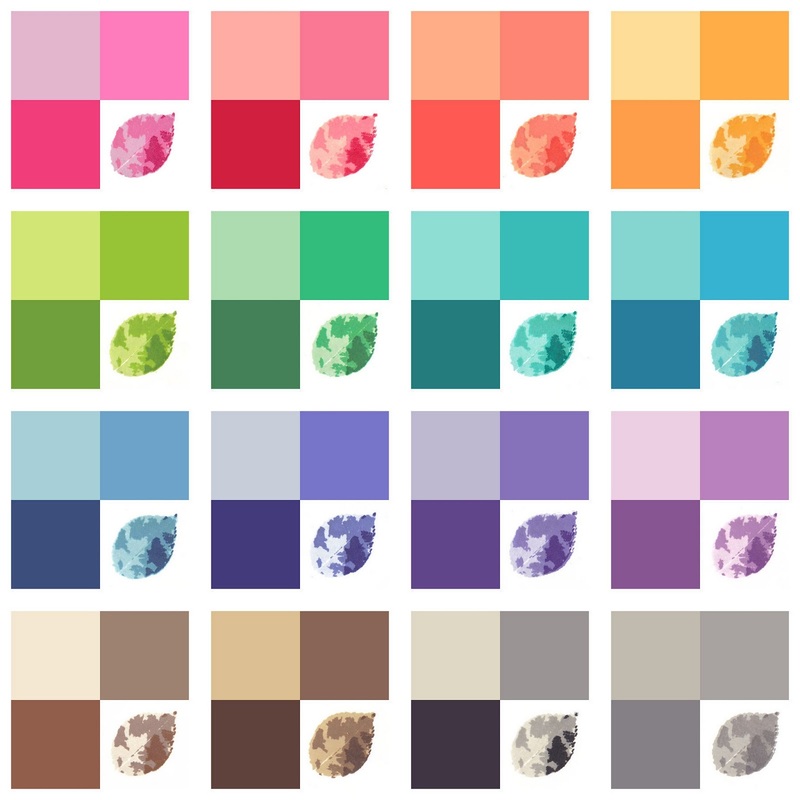 I started by indexing the inks - you can see how vibrant and saturated these colors are. They are also grouped into 16 color trios (light, medium, dark) for color matching and layering. I actually made 2 sets of index cards - one to add into my existing index, and another to group the trios together with a sample of what they look like layered. (These little 2" square cards tuck neatly into coin binder pages, which I keep in a binder next to my desk.) You'll notice the contrast here is pretty great between the layers on my stamped samples - that's because each layer got two impressions with the MISTI - when I layer images, I don't usually double up like that. I used a solid stamp to ink up a little strip of label paper for each pad so they're color coded on the front. (I use this label paper - it's a great value!). I started by stamping a detailed image to see how the ink performed with fine lines - you can see that the image is crisp and clean. I did a couple of samples using Copic markers, and the ink was perfect - no bleeding at all (summer sneak peek there!). The ink dries very quickly on paper too - in fact I noticed how clean my fingers were when I was indexing. So impressive! Next I moved to watercolor, and you can see in the photo how much water I used for the background coloring - the ink is permanent on paper, even when wet. I did a card using the inks with layering stamps, and they worked very well - on these ones, I used the lightest ink for the first 2 layers (one impression on the first layer stamp, and 2 impressions on the second layer stamp). The 3rd stamp was done with the medium color (2 impressions), and the final layer with the darkest color. I did some layering for a background, brushing all 3 inks together on the background, then stamping the darkest ink with a Cover-a-Card stamp and some other design elements (summer sneak peek again!). The inks can be used on fabric and canvas (they're permanent when heat set) so I tried out a background on this mini canvas - I rubbed the pads directly on the canvas then blended lightly with my finger. After that I was able to stamp directly onto the canvas with the inks to make this little scene, and blend with a SU blender pen. A tip for canvas panels like this - you can set them in your stamp positioner without the foam pad and stamp with clear stamps - the height is just right! Here's an image colored with pencils and blended with OMS - no smearing. So what can these inks not do? Well, their quick dry time means they're not good for heat embossing. They're also not good for watercoloring, as I like to do with a drop or swatch of ink on a palette. If you made it this far, you know that I'm impressed with these new inks, and I'm looking forward to playing with them more! I've read that they can be used on glass, wood, and other nonporous surfaces that can be heated, so there's more playing to be done! One thing to note, in case you're like me and don't clean your stamps... there is something in the formula of this ink that pulls up old dried ink from stamps, so if you're using a lighter color on a stamp that's been used with a darker color, you may not end up with the color you thought you were stamping. That's all I know! Hope this information is helpful to you - if I discover more, I'll be sure to share! Love the inks! And also the stamp of the mouse in the tea cup, who makes it? I would love to get it. Maria, it will be coming out from Impression Obsession in a couple of weeks! Thanks for explaining these inks! I am trying to find an ink for me other then SU and CTMH. I like Stamps of Life but thinking this might be a good one too add to collection. Great coverage on these inks. Thanks for posting this. They sound like great inks and will give them serious consideration. Thanks Dina, great info. I am slowly building up my collection.